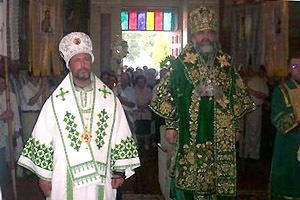 Metropolitan MICHAEL of the UAOC of North and South America and the Diaspora with Metropolitan MEFODIY of Kyiv and All-UKraine, Primate (Predstoyatel) of the UAOC worldwide in Ternopil in July 2005. The Ukrainian soul is not bound to an ignorant, indifferent master. Its spirituality is a free flowing brook that pours into the heart of God. The faithful need not ask non-Ukrainians for permission to walk with the Almighty in a certain way. Nor are they bound to the misguided decisions made for them in years past. His Beatitude Metropolitan Mefodiy of the Ukrainian Autocephalous Orthodox Church in Ukraine has emerged as a voice of national spiritual unity in a sea of religious discord. This leader has challenged the notion that Ukrainian bishops must be titular hierarchs of Greeks if they wish to escape Russian church oppression. In October, His Beatitude will visit the United States. It will be historic in many ways. He is playing an important role in the re-birth of a distinct national Ukrainian Orthodox faith, respectful of Byzantine Catholic sisters and brothers, that is neither Russified nor subservient to Constantinople. In a letter inviting the faithful to celebrate the Liturgy with Metropolitan Mefodiy, His Beatitude Metropolitan Michael of the Ukrainian Autocephalous Orthodox Church in North and South America and the Diaspora, the designated representative of the Primate (Predstoyatel) and who was commemorated Archbishop of New York and Metropolitan of All America and the Diaspora by Metropolitan Mefodiy during a recent visit to Ukraine, observed that "during the past ten years, the Ukrainian Orthodox Church has undergone many challenges and obstacles that have threatened the very existence of our religious and cultural heritage." "A revived single national Ukrainian Orthodox Church is to conduct the very important mission of returning the nation to its spiritual sources." Metropolitan Michael added that "by the Grace of God, we have survived, both in our Motherland Ukraine and in the Diaspora and continue to practice and promote our rich and precious treasure, namely the Ukrainian Orthodox Faith in its pure and proper form." He said that despite the unfortunate eagerness of some to submit to the jurisdiction of foreigners, Ukrainian Orthodoxy has remained, due in part to the leadership of Metropolitan Mefodiy, as pure as a brook without the bounds of foreign control. The Autocephalous Orthodox Church is in its third resurrection since its birth. It has never submitted to non-Ukrainian authority. Nor does it have the spiritual insecurity to seek the protection of an ecumenical patriarch. It is extraordinary that in the post-Orange Revolution period that any branch of the Ukrainian Orthodox Church still would allow itself to be subservient to anyone. The days of tsarist serfdom are over. Communism is dead. Ukraine is free. And so must its faith. The Ukrainian faith cannot blossom under Greek authority anymore than it can under the Moscow Patriarchate. Those in Ukraine and the many in the Diaspora need to stop asking permission to be Ukrainian. They need to stop asking permission to be themselves. A brook that is bound is not spiritually free. Priests and their faithful need not be chained to false righteousness that diminishes their heritage. The Orange Revolution not only symbolizes political freedom, it also represents spiritual liberation. It is the spiritual re-birth of Orthodox Ukraine, with love and respect for Byzantine Catholicism and all other denominations, that will be celebrated by Metropolitan Mefodiy's October visit to America. Anyone interested in more information about the American visit of His Beatitude Metropolitan Mefodiy of Ukraine should contact Bishop Paul Peter Jesep at VlaydkaPaulPeter(at)aol.com. His Excellency is Chancellor of the Archeparchy and Synellus of Public Affairs and Government Relations for the Ukrainian Autocephalous Orthodox Church of North and South America and the Diaspora. He is also Episcopal Vicar for Colombia and Venezuela.